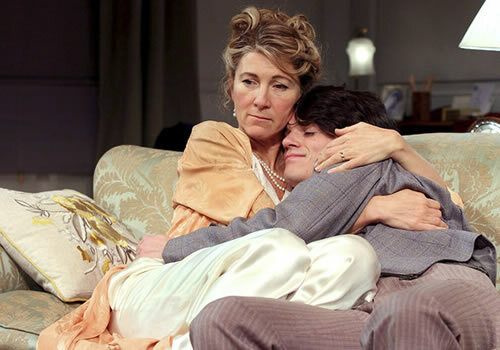 15 May 2017 - "the play still manages to strike home"
Following a five-star opening at the Menier Chocolate Factory, Trevor Nunn’s production of Love in Idleness transfers to the Apollo Theatre for a strictly limited 50 performances. Last seen in London in 1944, the brilliant Terence Rattigan comedy plays from May 11th 2017 at the West End venue. Love in Idleness takes place during the final years of the Second World War, when 18 year-old Michael returns home after four years away in Canada. On discovering that his widowed mother Olivia is the mistress of cabinet minister Sir John Fletcher, he pushes his youthful ideologies until sparks fly and relationships shatter. Casting includes Olivier Award-winning actress Eve Best (Hedda Gabler) as Olivia, Anthony Head (BBC’s Merlin) as John Fletcher and Edward Bluemel as Michael, as well as Vivienne Rochester and Nicola Sloane. Helen George will not reprise her role as Mrs Fletcher in the West End production. Acclaimed director Trevor Nunn (Fatal Attraction, Relative Values) leads the production, after tremendous success with Terence Rattigan’s Flare Path. Love in Idleness features design by Stephen Brimson Lewis, lighting design by Paul Pyant, sound design by Gregory Clarke and projection design by Duncan McLean. Written by the famous dramatist behind plays including The Winslow Boy, Harlequinade, The Deep Blue Sea and many more, Love in Idleness is once of Rattigan’s rarely performed plays. Playing at the Apollo Theatre for a limited season, the production runs from May 18th, with previews beginning May 11th 2017. Love in Idleness may not be suitable for young children.